Mobile phones have come a long way in just under ten years. Remember the days of having to hit a numeric keypad three consecutive times just to type a single character for a text message? Or what about the 160-character SMS text message limit (that Twitter would later go on to adopt as for their 140-character tweet limit)? Thankfully, these limitations were relegated to the past with the introduction of new mobile technologies. One technology in particular that dramatically changed the capabilities of cell phones was the introduction of 3G networks to North America in 2002. At that time, the student housing industry was still a tiny niche market and the term "purpose-built student housing" was primarily reserved for on-campus residence halls only. Fast forward ten years to 2012; it's around then that we started seeing a shift in the way renters, especially student tenants, access information about rental accommodations. Nearly 71% of respondents agreed that they rely upon and utilize the Internet for their apartment searches now (2015), more than they did three years ago (2012). 72% of respondents in the survey reported to using the Internet first when searching for an apartment. Nearly 50% of respondents reported they use a smart phone to search for an apartment online. Only 14% of respondents indicated they never search for an apartment on a mobile device. The last two points are most significant. Mobile apartment searches are becoming increasingly common, particularly with the younger renter demographic. The following illustrates the increase in mobile traffic over the last few years to our website, Places4Students.com. Other research also suggests that mobile apartment searches are skyrocketing in student housing. A white paper published by Catalyst Austin titled, The Mobile Revolution in Student Housing, found that 51.92% of student housing website traffic was generated from mobile devices. It would be reasonable to predict that this number will continue to grow, along-side a moderate decline in student housing website traffic from desktop/tablet devices. In further support of this data, a report from think with Google stated that millennials are more than twice as likely as the average person in the U.S. to explore real estate information on a mobile device. So what all does this mean for student housing owners and operators? A mobile-friendly website will become an absolute necessity. As early as 2015, Google has already been showing preference to mobile-friendly websites. Is your site mobile-friendly? If not, Landlord Web Solutions can help with that. A presence and regular engagement on social media channels will become increasingly important. Consider that the white paper from Catalyst Austin found that 87% of social traffic and 73% of paid searches came from mobile devices. Student housing owners and operators should start exploring other mobile capabilities that can be integrated with their properties, such as mobile property inspections. As we've discussed before, the student housing market tends to be an early-adopter of new technologies, as its residents are more tech-savvy compared to other multi-family segments. 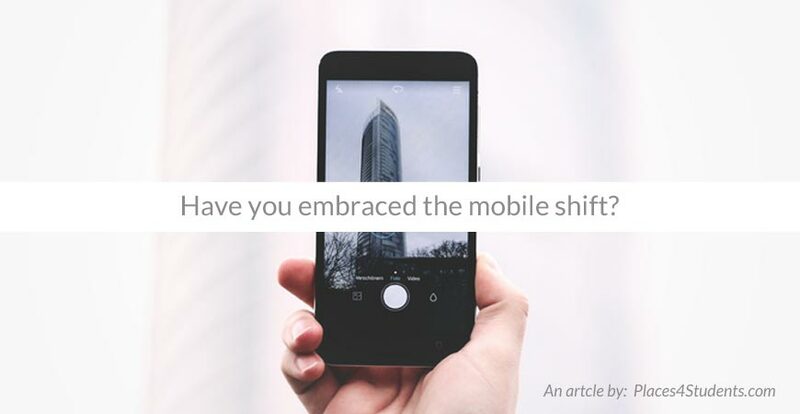 To keep up with its residents, student housing professionals are encouraged to embrace the mobile shift and look at ways to incorporate it into their overall marketing strategy.